Angela Thomas is the founder and current president of RP Capital, he has been instrumental to the company’s growth since she started with the company back in 2010. 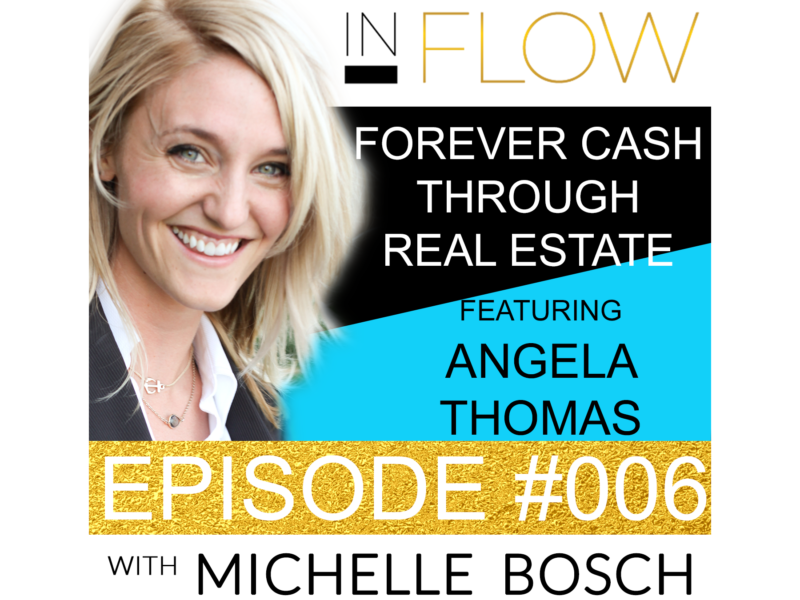 In this episode, Angela Thomas and Michelle Bosch chat about the ins and outs of investing in real estate. You’ll find out about what RP Capital does, and how they empower people to become financially free via real estate investment. Angela also discusses the role of her mother, and how she inspired her to become the woman she is today. You’ll also find out a little-known secret for investing in real estate and saving a huge amount of money! 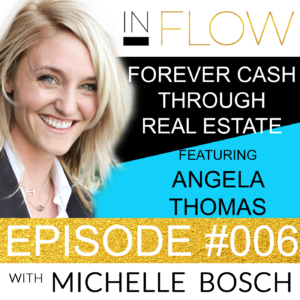 Angela Thomas believes so strongly in her type of real estate investing because you buy that property one time, and then you can’t outlive the cash flow. Angela Thomas’ plan for retirement is not to save up money in a 401(k) and hope that she doesn’t outlive it. Michelle: Welcome to the In FLOW Podcast. I am your host, Michelle Bosch. I see a gaping hole across society that focuses on the outer work and forgets about the inner work, when what we really need is to bridge the gap between prosperity and spirituality to live a life inflow with inflows of light, inflows of cash, inflows of creativity, inflows of grace in our lives. Each week, join me for powerful messages and interviews that will leave you inspired and ready to step into flow in your higher work. So now, let’s go.Welcome to the In FLOW Podcast. I am your host, Michelle Bosch. And today, I am very excited to have another lady as my guest for this episode, and her name is Angela Thomas. And Angela Thomas is the founder and current president of RP Capital. She has been instrumental to the company’s growth since she started with the company back in 2010. And I know her and, you know, and the co-founder, and we go back maybe…I don’t know, four or five years. We’ve been part of a Mastermind together. And so, I know what Angela and what Ron stand for, and RP Capital and their values. And so, that’s one of the reasons why I really wanted to feature her on today’s episode. She is a powerhouse of a lady and I will go ahead and right away bring her board, and hello, Angela. How are you? Angela: Hi, Michelle, I’m great. I’m so excited to be on here today with you and so honored that you would want me to come on here and speak with you about what we do. Michelle: Wonderful, yes. I’m very excited to have you guys. Just for our listeners and for the ladies to know, RP Capital is one of the largest turnkey operators in the country, and you guys pretty much work nationwide in bringing the opportunity of investing in single-family homes, which I know your bread and butter and your X-Factor there. And that was one of the reasons as well why I wanted to bring you on board. In my prior episode, I had been talking about “Not all cash is created equal.” That there’s one-time cash, which is cash where you work once and you get paid once. And then there’s temporary cash; you work once and then you get a stream of cash flow for a specific period of time. And then you have what we call, you know, “forever cash flow,” which is cash flow where you work for it once, and then that passive cash flow comes forever until you decide at some point to either sell the asset or liquidate the asset in some way, shape, or form. But it’s there for you always. Michelle: So on the context of that, I want to go ahead and get started, and ask you tell us how and why people should look out there into investing your specific asset class? You know, in this case, single-family. Angela: Yeah. So the whole reason that RP Capital exists is because Ron has been investing in real estate since 2005, and we wanted to make it easier for everyone to be successful in real estate investing. And the reason is because he was, at the time, he was flipping homes back in 2005. And, you know, a lot of people out there think that flipping is real estate investing. If you’re rehabbing and selling houses for a profit, you’re investing, right? So like you said, if you’re leading, you know, a rehab team, you’re working for that money one time. You get paid one time when you sell it, right? And then you have to go out and find another deal, rehab it, and do the whole thing again. So you’re trading hours of your time for money, right? Angela: So the whole reason that we believe so strongly in our type of real estate investing, which is long-term hold for cash flow. So you buy a property one time and you get cash flow forever. The whole reason we believe in that is because it’s truly passive investing. You’re not treating your hours for the money. You buy that property one time, and then you can’t outlive the cash flow. It just keeps coming in, right? Angela: So we believe that’s the ultimate way to become financially free, and the ultimate way to retire because, you know, like I said, you can’t outlive that money. You can never run out. It’s cash flow forever from that one purchase. And that’s what we teach our clients to do. Michelle: Yeah, absolutely. And I have been the beneficiary of that type of cash flow. Part of my story on one of the episodes prior was me sharing that my father passed away when I was very young, and there was this one single investing decision that he made that really impacted my mother’s life and mine in a tremendous way. And he was able to pretty much take care of us, even though he wasn’t there. So how passive can it get? You know, my dad, he’s not even there, and he’s able to basically put me through school, put me through university. It continues to spit out cash flow for my mother, so it will definitely carry her into her old age. And if, at some point, she doesn’t decide to sell it, even my daughter Sophia [SP] can reap the fruits of that as well. So I totally get it. You know, moving from basically being an active investor to a passive investor is the goal, absolutely. So tell us a little bit about…because you have a fascinating story and I wanted everyone to hear it, about how you grew up around money and finances and kind of like what your role models were and so on. Just, like, give us a little, like, sneak peek. Take us into, you know, Angela’s story as she was growing up. Angela: Yeah, so, it’s interesting you said that your dad passed on early. So my dad didn’t…he’s still alive, but he was not an active participant, really, in my earlier years. He had a lot of issues that I won’t get into. But basically, my mom left…you know, I don’t want to…I love the guy, he’s an amazing dad. But as far as the financial responsibility of taking care of me and my three siblings, it all fell on my mom. And I remember when I was four or five watching her struggle so hard to start her own business. She actually remodeled our house we were living in at the time and had to take out loans from everyone she knew to be able to do that. And turned it into a residential care home to take care of elderly. She ended up taking care of her own grandma that had Alzheimer’s and then several other people as well. So she actually ran that business out of our home from the time that I was very young, and she was always so stressed. I mean, she did okay. We usually…we did well, she was able to take care of us. But the money she brought in was entirely dependent on how much time and effort she spent on that business. So as I got a little older, I watched her. She started to attend real estate seminars and she read all the “Rich Dad, Poor Dad” books. And a few years later, she decided to dive head-first into investing by selling her home and business in California. She did a 1031 exchange into five rental properties in Utah. No one taught her how to do it; she just learned what she did from books and just dove in and did it, which is crazy because it actually worked for her. But you know, she did a 1031 so that, you know, it was tax-deferred. And then, she has been living off her rentals ever since. So I really witnessed the power of real estate. She was able to become a passive investor and able to semi-retire and spend more time with her family. It was so cool to watch and it really, you know, freed up the stress in her life and it’s just been amazing for her. Actually, about three years ago, she decided to sell those homes in Utah and she bought two fourplexes through RP Capital, through Ron and me. And we actually helped her triple her cash flow, so she’s doing even better. So that’s always the next step, you know? She struggled so hard to get started. She built her own business to get the money to invest initially. And then, she started out with single-family homes and then was able to reposition and move up to bigger multi-families and increase her cash flow. So she’s doing even better now. Really, really cool. Michelle: Yeah, and that’s why I love real estate, because it can be so incredibly transformational. You can look at it transactional, you know, but it can be so transformational going forward. And just for the ladies that might not know what a 1031 exchange, do you want to elaborate a little bit on how that works? Angela: Yeah, so it’s this really cool little secret that not everyone knows about that you can do…so that you don’t have to pay taxes on all the money that you gain on all your gains from selling properties. So what you do is, you know, you contact a 1031 coordinator, and they help you…when you sell your properties, the money goes into the 1031, and then you select your next properties that you’re gonna purchase, and the 1031 buys them for you, and you don’t have to pay the taxes on all those gains as long as you keep your debt the same. So she was able to take her mortgages on those five properties and basically transfer that debt over to these two fourplexes and not have to pay taxes on her gains. Michelle: And you have about, you know, I think, like, 45 days. It depends on that 1031 because [inaudible 00:09:57] or a neutral party that you choose. But I think for the most part, you have a fair amount of time to identify it. I know we’ve done in the past and what we have done first is…because we knew we had a hot market here in Phoenix, we first identified the property that we wanted to roll our gains into. And then once we had identified that, we decided, okay, to put our property on the market, because we knew it would sell within that 40-day period. But traditionally, I mean, you could go about it by just first selling your property and then having 45 days to wait [inaudible 00:10:27], and then another, I think, 45 days to actually close on the transaction. So yeah, that’s like a cool little trick that very few people know about that, you know, is out there available, absolutely. Now, tell us a little bit about RP Capital as far as what is the secret sauce? What do you guys do exactly for, say, a family with an income of, I don’t know, maybe $80,000 or $150,000 to $200,000 that says “I would like to start investing some of my money. This is what, you know, we have available either from our Roth IRA or 401(k) or in cash, or whatever.” What makes you guys so special and why do you guys have people coming back to you over and over again continuing to have you guys help them grow their money and their passive cash flow? Angela: Great question. So what we like to think makes us different and why we believe that 70% of our investors continue to invest with us over time is that we really strive, as a company, to serve first in every interaction that we have. So when somebody comes to us and…we will help anyone, we don’t discriminate. But when somebody comes to us wanting to know how to get started, we start them out with free education, showing them how to go out and invest in real estate on their own. And we teach them the entire process; we don’t hold back any secrets, we show them what to look for, how to do it…you know, how to get the best deals, the best lending, how to find and vet property managers. Everything that you need to know to go invest. And then our whole sales pitch, if you can call it that, is that instead of you having to go find all these deals yourself, we have already done all this work for you. We already have amazing, you know, rental properties ready to go in ten states currently. So that’s our whole sales pitch when we do it. So the education part is completely free. Then we take that person and we build them what we call a “wealth plan” in our proprietary software that we built. The wealth plan, we actually go through and figure out your “Why.” What it really is that is motivating you to make this change and what you’re trying to achieve in your life. Usually, it’s something bigger than just finances, right? [inaudible 00:12:50]. You want to spend more time with family or whatever it is. So we find out their “Why,” then we do a financial assessment and just kind of figure out where you’re at currently. And then, the next step is we take you in and we fill in real properties, and show you how you can meet your goals faster than you ever thought possible. So we will do that for anyone. Even if your regular family are making $80,000 a year, we can show you, with that wealth plan, how you’ll hit those goals faster than you thought you could. So we truly believe we can help anyone be successful in real estate investing. Michelle: Absolutely. And usually, the goals, like you said, they’re really not financial. Maybe the financial is a means goal, really, to the end goal, and the end goal is really something that has to do with feelings and quality of life and so on and so forth. And I just wanted to add that, yeah, your emphasis on service…you know, and when you bring that core value of service along with the technical expertise of finding the property, you know, renovating the property. Having already a property management company that will run and operate the property for you, and you guys having that along with the vision, you know, and the mapping that you do for the client based on their “Why,” that all…like, it’s a recipe of many things that come together to make, you know, really, a project and an investment be successful and not be risky. Because a lot of people see real estate investing as risky, but it’s risky because you don’t have the knowledge and you have not aligned yourself with the right partners that share your same values and that have the technical expertise and all the right relationships in place to basically make that as it truly perform, you know, at the level that it’s supposed to perform for you, and that really aligns with your goals. So yeah, I totally agree. Now, one question. I know you guys have, since 2005, have sold over $500 million in real estate and assets. And so, how does RP Capital get paid? Like, when somebody approaches you, a family approaches you, or a woman, a lady approaches you and says, you know, “I would like to start investing, I don’t know, $50,000, $100,000.” So how do you get paid? How is that structured? Angela: So another great question. We get that a lot. Because our core value is, you know, to serve first, people are like, “Well, you know, there’s got to be a catch, right? Where are you making your money?” Obviously, we’re making money. So one of the big things that set us apart from many other investment companies out there is we are truly a real estate company. We’re a real estate brokerage. All of our consultants are licensed real estate agents. And we pay a normal real estate commission at the close of a deal, just like any other real estate agent. Like the agent that sold you your house. They show you the house and they get paid a commission at close. We’re the exact same way. So we operate our entire company off of…we take both the buyer and the seller aside, so we get a 6% commission. And we operate our entire company off of that. So we do quite a bit of volume, but we get paid just off that 6% commission. You don’t pay anything to view our properties or for any education, there’s no hidden fees there. So it’s just…if you decide to buy one of the properties in our inventory. Michelle: Got it. And then from there, you guys do all the heavy lifting and basically at that point, you get paid by the seller, not by the investor or the buyer. Makes sense, absolute sense. So now, I wanted to bring it back to the personal, and I wanted to ask you…I know you have like…I think he’s two or three years old? You have a three-year-old, right? Almost three? Angela: Yeah, he’ll be three in December. So cute. Michelle: I know, I see him sometimes, so cute. You know, you post pictures on Facebook and I’m like, “Oh my goodness, he’s so cute.” And so now, you’ve seen your mom and what an amazing role model you had there. And so, now, I wanted to ask you, on your end now, you see so many families being transformed by the power of investing in real estate. And so, how are you investing? Where are you investing? What are you doing, you know, with your son in mind, with retirement for you as well in mind at some point, and so on and so forth? Angela: Yeah, so one of the reasons I joined Ron’s company back in the day is because I believed so strongly in real estate investing. So my plan for retirement is not to save up money in a 401(k) and hope that I don’t outlive it. I’ve gotten started in real estate investing; I’m starting small with a couple single-family homes. And my goal is just to keep building that up. I’m hoping to buy…I want to buy at least one new property a year. A lofty goal, but I think I can do it. Michelle: Oh my god, yeah. Totally. Michelle: That are predictable, yeah, and boring. Yeah. Angela: Yes. Boring, boring markets. I love boring markets. So that is our whole [inaudible 00:18:41]. Michelle: Can you share just a few markets, maybe two or three, that you guys are, you know, [inaudible 00:18:46]? Angela: Yeah. So the market we’ve been in forever is actually where Ron is originally from, Kansas City, Missouri. We never invest right in the city because, you know, those properties tend to have higher turnover and more issues. So we always invest in little subdivisions right outside of the city, so you have a quick drive to your job, commute, whatever. Michelle: Yeah, I can see. It’s markets where you hear crickets. It’s not like Phoenix, Arizona or Florida that saw back in 2008-2009, this incredible loss of just equity and values weren’t there. Michelle: So I can tell the strategy there, absolutely. Michelle: Yeah, absolutely. Now, on the more inflow side as in, like, the state of flow, I know you run the show there for Ron, you know, the CEO and president of the company. And so, Angela, I wanted to ask you, how do you get inflow as in, like, to get inflows of cash in your life with ease and grace and be able to, you know, manage a team of…I don’t know how many people there are in the office. And how do you basically bring ease and grace into your everyday life? How do you step into that? Angela: Well, it’s a struggle for me every day as it is for everyone. Yeah, it’s about getting in that right headspace and usually, you know, for me, first thing in the morning, I start out with…I need prayer to get me in the right space. But also just reminding myself of what’s important in the morning, being grateful for what I have. And then, another thing that really helps is making sure I am constantly reminding myself and connecting all of my monetary goals to my bigger passions and purpose, the things that really inspire you. You can only get so excited about hitting some sales number or whatever, but if you can connect that goal to your real passion, that’s when the magic happens. That’s when you’re always successful. So yeah, I do have to remind myself of what I really care about every single day. Or I forget and, you know, you just kind of feel lost and adrift, and we don’t want that. Michelle: Yeah, absolutely. Yeah, and I love how you said that prayer for you is the way that you, you know, incorporate faith and spirituality into your lifetime goals and how you bring heaven to earth in your everyday life, and it could be different for other people; it could be exercise, it could be a walk in the woods. But prayer is definitely one of my to-gos as well. Now, what do you wish you would have known at the beginning when you started in real estate that you wish you would have known then? Angela: Okay, I don’t know if this is gonna answer your question or connect with anyone, but…this is probably silly, but for me, the thing I wish I would have known is that age is just a number, because…I don’t know if you know my story way back, Michelle, but I graduated college very young and got into the professional world very young. Michelle: How old were you? Angela: I was 18 when I graduated, so I was 14 when I started. It is crazy how much time they waste. Sorry, I didn’t mean to interrupt you. But how much time they waste in public school, when you’re actually just trying to learn instead of going by their proscribed methods, you can get through it incredibly fast. And I didn’t feel like I was ready for college, but I tested in no problem and tested out of high school. So I just knew more than I thought I did. Michelle: Oh my god, she’s like a freaking…she needs a cape. Angela: I know. She’s awesome. She’s intense, so you better watch out. But she’s awesome. Michelle: Yeah, absolutely. I’m sure you’ve inherited some of that, and, you know, that’s why you’ve been leading the company for several years now or since inception. Michelle: Yes. So now, what advice or what top three things you have for women starting out or that are already successful that will help them, you know, create inflows of cash, inflows of ease, inflows of grace in their lives in terms of like, you know, balancing being a mom, being, you know, CEO of a company? Any three things that you have for either women starting out or that are already successful that come to mind? Angela: …right here in Salt Lake. So I’ve just seen so many women that get…you know, they feel hopeless. Like there’s no way out of whatever situation they’re in. That they can’t take that step. That their situation in life has been set up so that they can’t be successful. That there’s, you know, some roadblock and they’ll never get past their…whatever job they’re in or their stay-at-home status because they don’t have the right work history, whatever it is. I just want to say that if you get creative when you’re just starting out and don’t follow the traditional paths, there is always a way. There are so many resources and so much money out there, and you don’t have to just follow the path that, you know, you were taught to follow. You don’t have to just go get somebody to hire you. There is always some creative way to make money and to get started and to figure it out. Prayer really helps there just to figure that out. But I just want to say that, yeah, you don’t have to follow the traditional path and there’s always a way to reach your goals if you get creative. So that’s my number one. Number two is to find someone who’s already successful in what you want to achieve and follow their example. Specifically, I’m thinking of real estate with this one. It’s so much easier, but it applies to, you know, any area. But it’s so much easier to be successful at something new that you haven’t done if you are following somebody who’s been there and already made the mistake, so hopefully, you don’t have to repeat them. Michelle: Yeah, [inaudible 00:26:32] time for you, absolutely. Michelle: Aren’t we all mothers that way? Angela: It’s so easy to change paths at the slightest sign of trouble. You know, just because something is hard or has a few problems; you know, a few little bumps on the way doesn’t mean you’re on the wrong path. I mean, there’s a million examples I could give on this one, but specifically in real estate, like, you know, the very first house or the very first fourplex that I sold to my mom when she was buying fourplexes through our company, the brand-new, supposedly awesome tenants put in there. And she has…one of her units, the police came, knocked down the door, damaged a bunch of things because the guy living there had a crazy ex-girlfriend that was mad at him and called the cops on him and told them he had drugs. All this stuff. So I’m like, “Mom, yeah, you can trust us. We’ve done this with, you know, 5,500 people. You know, we know what we’re doing, we’ve seen everything. This is gonna be great.” And her very first property, that’s what happened. So that does not mean it wasn’t the right choice, okay? Angela: She’s still very successful and her cash flow has increased a ton. It was just a bump along the way. Angela: But things like that happen, you know? Michelle: Yeah. Same here. We’ve had bedbugs, and we’re like, “Okay, we know now that it just requires a check and the bedbugs are gone,” and/or, you know, a hoarder situation that we had. But these are just small bumps. But compared to the freedom that knowing that you have mailbox money pretty much is how I see it coming in every month, and that if you just see it from the point of view of just being, you know, one home and having, I don’t know, maybe $800, $900 cash flow from one home. But then, when you start really compounding that…and if you think about it now, it’s five homes, ten homes, 15 homes. Especially if…and depending on your goals and where you’re at. But then, you’re like, “Okay, very easily now, this passive cash flow can completely replace my income or my husband’s income, or…you know, it can pay for X or…and so on and so forth.” So the moment you start seeing it not just from the point of view of just that one single investment, but more of a compounding effect with more and more of those assets building up that residual, it starts really making a difference. And even if it’s just one…I remember when…because we started actually in land, and I remember selling our first piece of land which is a 40-acre parcel, long-term seller financing, and we were getting, like, 300 bucks every month. The guy put, like, $2,000 down, and then the remainder, he was gonna pay over, like, a seven to eight-year period…note. And I remember thinking about it. “Oh, wow, this is making my car payment. Like, that one single piece of land, you know, is making my car payment,” and my car payments were only out for three years. And even after the three years, I was still gonna be getting my 300 bucks from that piece of property. So that’s just a power of compounding. And even if you just see it from a single one-asset perspective, it still makes a difference. And the moment you start compounding, it’s just…it’s fantastic, yeah. Michelle: So now, I wanted to then come towards the end and ask you what would be the best way for a lady that wants to start investing, you know, in single-families and doesn’t know where to start, and that not necessarily wants to go through the typical route sometimes, but just to go to a seminar, educate herself, and actually being an active investor and finding the home, you know, finding the property management or doing the property management herself, like, how they can find a little bit more about your company, what you do. Where can people reach out to find out more about you? Angela: Yeah, so a great place to get started is just visiting our website, which is rpcinvest.com. So the “R-P” is for “Ron Phillips” and then “C” invest. So it’s rpcapitalinvest, sorry. And then for everyone listening to this show, you’re also welcome to…you don’t have to go through the traditional route to talk to somebody. If you’d like to shoot me a personal e-mail, my e-mail is angela@rpicinvest.com. Or you can give me a call at 801-907-1737. I’m happy to get you started with education. We can get you set up with a wealth plan. Angela: Feel free to reach out. Michelle: Awesome. You get the head honcho. She just gave her out personal phone number and e-mail. Take advantage of it. Michelle: Perfect, perfect. I greatly appreciate it. You know, I seldom give my direct line, but I thank you very much. I thank you very much for making yourself so accessible. And Angela, it was a pleasure talking to you and giving us a little bit more inside scoop into what RP Capital does, how are you guys different, you know, in the marketplace. And we even talked a little bit about 1031 exchanges, which is like this wonderful, sneaky little trick. You know, how we bring balance into our lives and to have lives with ease and grace. That’s the whole point of real estate is so that we don’t have to work so hard to the point of burnout and then we have nothing to show for it. So I thank you very much, and I look forward to, at some point, having you back on the show. Thank you so much, Angela. Angela: I would love to. Thanks so much for having me. It was great talking to you. Michelle: I hope this episode left you feeling inspired and ready to get inflows of cash, inflows of light, and inflows of faith in your life. I welcome your reviews on iTunes. Please leave me a review and help me create an amazing community of women inflow. Thank you as always for sharing your voice by going to michellebosch.com and joining the conversation about this show. And while you’re there, grab a copy of my “Ten Commandments to Living a Life Inflow.” You can also follow me on Facebook @MichelleBosch and on Instagram @MichelleBoschOfficial. Thank you very much, and until the next one.